Dr David Feldman saved our life, and our daughter’s. The NICU could not diagnose her. They said they had never seen anything like her. They sat in my hospital room and watched my family and I sob and said, “We know this is a parent’s worst nightmare.” On Day 5 I begged them to grant Dr. Feldman visiting privileges to look at my baby. I had met him briefly while I was pregnant, at that time knowing only that she had bilateral club feet. When he arrived at the hospital that evening, on her fifth day of life, he diagnosed her in three seconds. Arthrogryposis. He was the only doctor who treated her like a baby and not like a science experiment; I remember so well that evening – he washed his hands, took off his jacket and he touched my little girl’s head. He then turned her over, took out her arms, listened to her cry, this tiny helpless little baby that had been all wrapped up in the ICU incubator and he said “Hi Caroline.” That was the first time I realized I had a daughter, and not an object that might die. And then he said to us, “This is the worst you will ever see her.” At that moment, I knew I needed to fight for her, rather than give up. For most children a milestone is a first smile, biting their toes, sleeping through the night, standing in their crib. For Caroline milestones included getting her feeding tube removed, moving her right arm for the first time at 5 months old, bending her knees. When she was three months old Dr. Feldman performed a major six hour surgery to correct her feet. I consider this the turning point in her life, meaning this was the beginning of her “recovery.” By six months old she was able to sit up. At 15 months she pulled herself across two feet on the floor. At 20 months she took two steps on her own. Dr Feldman has never been wrong. I am still searching for a doctor like him to take care of her upper body. One such doctor suggested she didn’t have arthrogryposis at all, because she was such an unusual case. Dr. Feldman scoffed – but I went ahead and did another round of extensive genetic testing only to have Dr. Feldman be proven right again. Caroline’s unusual case of arthrogryposis – meaning she has come so far so fast – is due to three factors: 1. Dr Feldman. 2. The constant, aggressive and extensive therapy we began the night she came home from the Nicu and 3. My daughter’s spirit and will. Dr. Feldman said the key to Caroline’s body would be therapy. She does 7 hours of PT and 7 hours of OT, 5 hours of feeding and one and a half hours of speech – every week. As a result, she crawls, walks, colors and eats. All things no one thought possible. Caroline is confident, optimistic, charming, imaginative, funny, opinionated, engaged. She loves witches and ghosts, the movie Annie and football players (thanks to her big brother). She loves singing (her favorite song is Happy Birthday and she sings it to whatever or whomever she loves, including her food and her doctors.) She likes to do everything herself. She strives to keep up with her brother and cousin. She loves making funny faces and having pillow fights and screams “love this” when she sees something pretty. When Caroline walks, she struts. When she speaks, she sings. Her struggle has been watched by people all over the city – the superintendent of my building cheers her on as she walks on the building’s treadmill with her PT everyday. The nurses at my pediatrician’s office cried when they saw her take a step for the first time. Her feeding therapist says the only way she gets an autistic four year old to open his mouth is when she shows him a video of Caroline saying “Happy.” I truly believe that like the book “Mike Mulligan and the Steam Shovel,” the more people who root for her, the harder and faster and stronger she gets. I often think about where we would be if we hadn’t met Dr. Feldman and it terrifies me. He is in charge of my daughter’s body and is saving it, or putting it back together. Caroline, on the other hand, has no idea that there is anything that isn’t perfect about her. And the only thing she doesn’t like about Dr. Feldman is the noise the saw makes when he takes her casts off. On days when I have cried, she is laughing. It is impossible to be sad around her because she is so sure that everything is fine and will be fine. 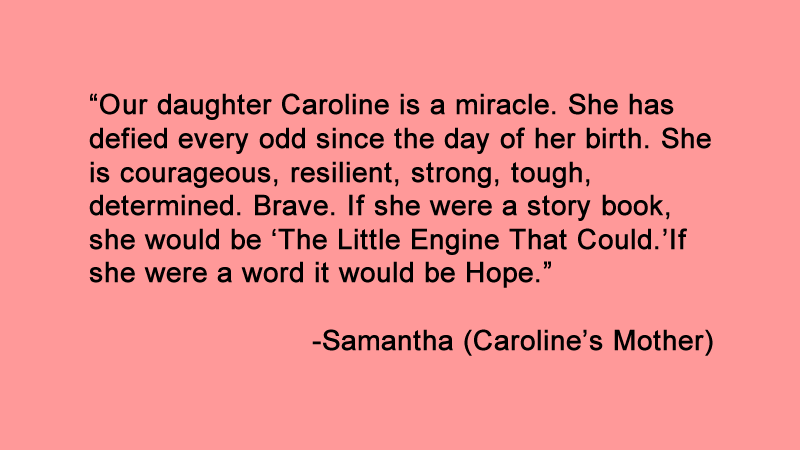 Since her birth I have thought a lot about what life should and can be for Caroline. And the answer is – no different than anyone else’s. I know that she has many struggles ahead, physically, but when I am with Caroline it is impossible not to think that anything will be possible for her. Just like any other child, children like Caroline need people to believe in them. I am grateful every day for having Dr. Feldman.